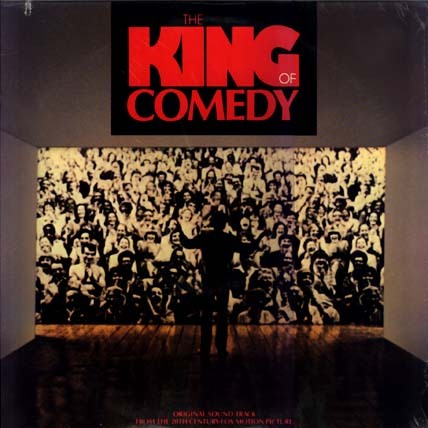 Robbie Robertson's soundtrack for The King of Comedy, one of Martin Scorsese's most overlooked films, was a blend of already-recorded tracks or out-takes by Ric Ocasek, the Pretenders, the Talking Heads, and Rickie Lee Jones, and specially-produced contributions from Ray Charles, Van Morrison, David Sanborn, Bob James, and B.B.King. Highlights are B.B.King's "T'Ain't Nobody's Business", Van Morrison's superb "Wonderful Remark", that was used for the closing credit sequence, Ray Charles' version of the Johnny Mercer/Harold Arlen classic "Come Rain Or Come Shine", The Prentenders' then unreleased "Back On The Chain Gang", and Rickie Lee Jones' divine "Rainbow Sleeves", a song by her old beau Tom Waits. When a Scorsese assistant called "Cowboy" Dan Johnson died suddenly of meningitis, the shock prompted Robbie to write one of the loveliest songs of his career. "Between Trains" was a tribute to Johnson, an eccentric loner who'd made a big impression on Robbie, and it featured both Garth Hudson on synthesizer and Richard Manuel on backing vocals. Robertson plays on the two tracks "Between Trains" (vocal, guitar, piano - R.Robertson, background vocal - R.Manuel, bass - Neil Stubenhaus, drums - Jim Keltner, synthesizer - Garth Hudson) and "Wonderful Remark " (vocal - Van Morrison, electric guitar - R.Robertson, acoustic guitar - Van Morrison, bass - David Hayes, piano - Richard Tee, drums - Jim Keltner, organ and synthesizer - Nicky Hopkins). A remastered version of "Wonderful Remark" was released in 2007 on the Van Morrison compilation Still On Top - The Greatest Hits (a 3-CD set, "WR" is track 19 on disc 2).